Our company pays special attention to security measures associated with the storage, production and movement of the original and produced content. Our content handling procedures conform and have been approved by Warner Brothers, Universal, Marvel/Disney studios. 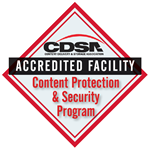 Our company is accredited and is a Member of CDSA Content Protection Program. We use only protected and secure channels for content transfer via internet, like SFTP or Aspera. Our facility is located in guarded, isolated premises, regularly patrolled 24 hours per day. Employees and visitors pass through a security control before gaining access to the facility; this is in operation 24 hours per day. Only top-level authorized personnel have an access to the source material. An access control system in the lab provides regulated access for staff and visitors to the restricted zones. All areas of indoor and outdoor areas are monitored with CCTV cameras; the recordings are maintained for a period of 90 days. All client materials are labelled and tracked in the accounting system during all production stages. All digital equipment that handles content is completely isolated from external data networks, and the entire internal network is protected with a sophisticated firewall and attack monitoring system. All workstations are also individually protected with advanced antivirus systems and firewalls. Every workstation is regularly inspected in accordance with internal security policies of the company.